It doesn’t take a rocket scientist to figure out that when you’re stressed, mentally fried and your 40-hour work week looks more like 70 hours, you need a bloody vacation! It’s what we all live for. But you don’t need weeks of annual leave up your sleeve to take a getaway that’ll bring you back to a more normal shade of human. We’re here to show you how to enjoy the most luxurious Queensland weekend escape, and it’s not where you think. 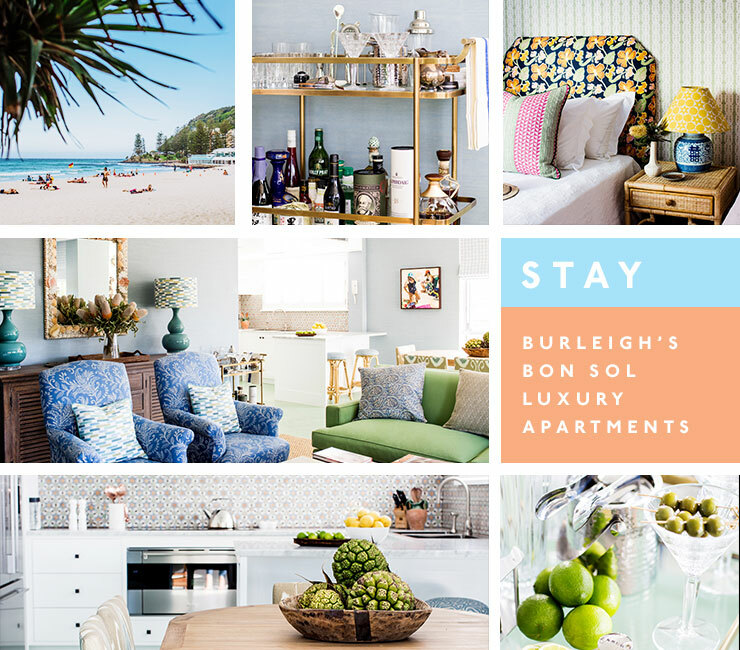 We’ve teamed up with Burleigh Heads’ luxe new vacation apartments, bon Sol, to give you the 411 on how to spend an unforgettable long weekend in one of Queensland’s most sought-after destinations. 12PM The most important thing for a self-indulgent weekend escape is to find the perfect place to stay. And if you want to seriously spoil yourself when visiting Burleigh, your go-to has got to be the stunning bon Sol Luxury Apartments. Across from the beach and a short stroll to all the action in Burleigh, this designer guesthouse welcomes you with champagne on arrival and a chic two-bedroom apartment that’s straight out of a magazine. 1PM If you’re not familiar with Burleigh, now is the time to get your bearings. Take a meander down to buzzing James Street where you’ll find cute cafes for juices and acai bowls smattered between fashion boutiques and homewares stores galore. Hello, holiday shopping! 2PM Where should you start your luxe long weekend foodie tour? At one of the best restaurants in Queensland, that’s where! Book early for a front-row table at much adored Burleigh hotspot, Rick Shores. Though with an enviable surfside posi, let’s be honest, any seat is the best seat in the house. Don’t leave without ordering Rick’s famed Moreton Bay ‘bug rolls’, before moving onto Pan Asian flavours such as roasted pork belly egg net salad and twice-cooked duck with fermented plum, washed down with any of Rick’s signature cocktails. Annnnd, relax. 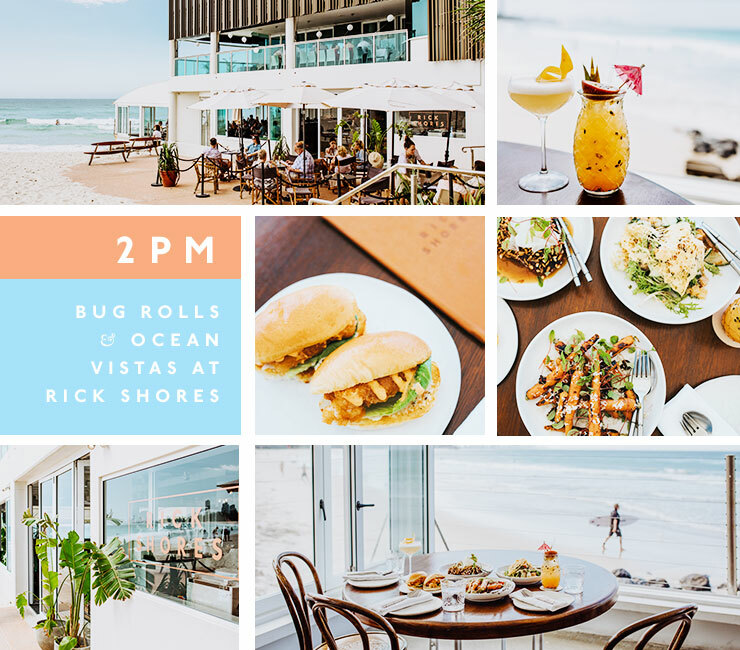 7PM While you could easily eat your way around Burleigh for the next week, we urge you to scoot 10 minute’s drive north to check out another of the Coast’s dining institutions. Recently undergoing a mega makeover, and in the process of adding a dramatic rooftop bar, Hellenika dishes up a Greek feast to satisfy even the harshest critic. 9:30PM Time for a nightcap? Lockwood is one of our absolute fave new bars on the Gold Coast. Hidden down a gritty Burleigh laneway and requiring a text invite to get inside, it’s the first of the Coast’s true speakeasy-style small bars and is totally worth hunting down for stiff whiskies and twists on the classics. With moody vibes, knowledgeable bartenders, and old blues and rock classics—good times are guaranteed. 8AM Wake up bright and early followed by a short jaunt to Burleigh coffee staple, Borough Greens. Here the coffee is smooth, the locals are friendly and glistening ocean glimpses will set the tone for the day. Stay in and order drool-worthy bacon and eggs rolls or warm poke bowls, or sashay down Burleigh’s foreshore with a coffee in one hand and your S.O in the other hand. Bliss. 10AM Sure, life on the Coast revolves around the beach though surprisingly no one else offers a private beach club-style sun lounger set up like the legends from bon Sol Apartments. It’s one of those special little extras you can request that will ensure you feel totally ballin’ on your luxe weekend getaway. Toes in the sand and cold drinks on ice? You may or may not decide to waste the entire day here (we would). 1PM Everything at Jimmy Wah’s tastes as good as it looks and you’ll be impressed from the moment you walk in. We suggest ordering the seven-course ‘Feed Me’ banquet at this contemporary Vietnamese gem and make your way through Yellowfin tuna sashimi with wasabi pea and soy dressing, grilled giant octopus with puffed wild rice or a flavour-packed twist on traditional pork larb with green mango and banana blossom salad. Mmmm. 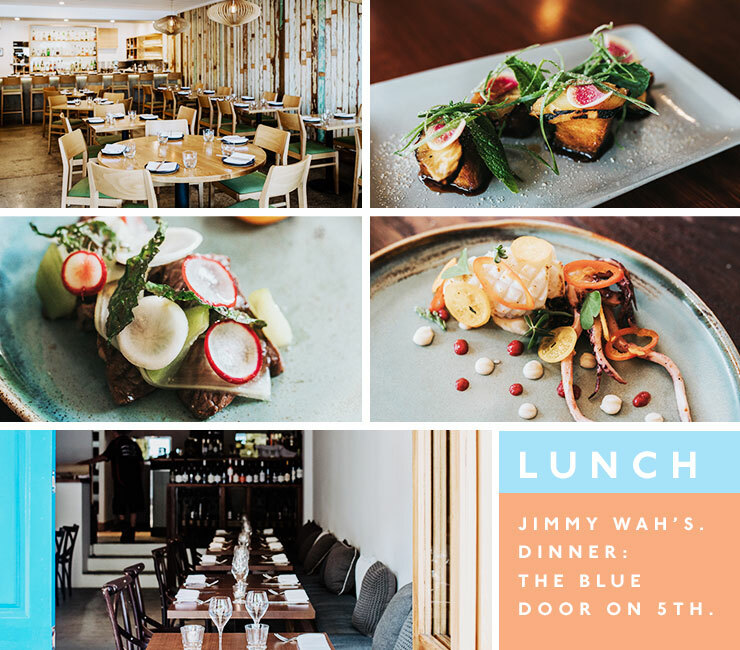 6PM One of the most Melbourne-esque restaurants on the Gold Coast, you’ll feel right at home at Palm Beach’s The Blue Door on 5th. At the hands of talented young chef Dylan Cashman, dine on freerange chicken from the Glass House Mountains stuffed with pickled chilli, Cudgen corn and ginger, or opt for the Ipswich suckling pig shoulder served with betel leaves, kale, Choko, apples and Kimchi crackling. With all produce collected within a 200-mile radius of the intimate 32-seat eatery, this meal is truly one for the foodies. 11AM We know what you’re thinking… There has been far too much eating and not enough moving. Lucky there’s a stellar national park with rainforest hiking tracks and lookouts right in your (adopted) front yard. 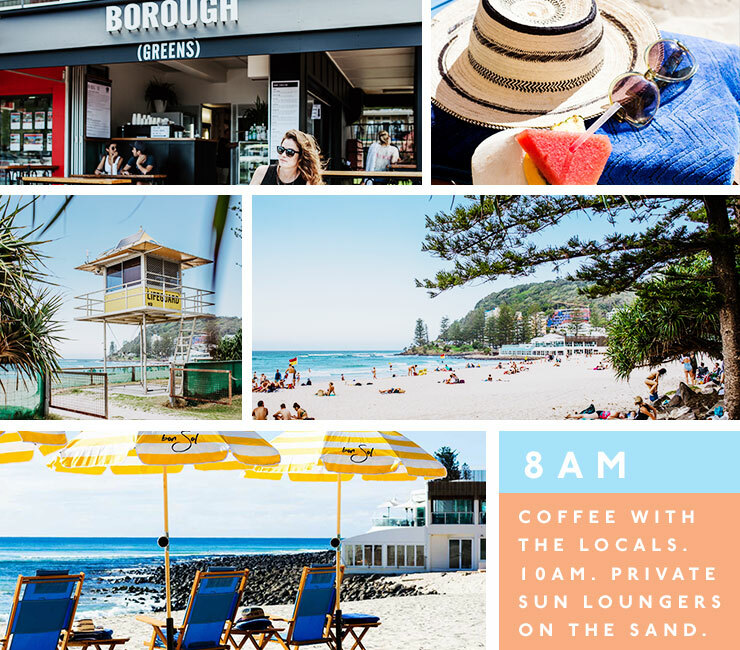 Lace up your sneakers and delve into Burleigh’s lush headland. Those whale sightings come for free. 1PM If you haven’t already filled up on woodfired Mexican burritos or buckwheat wraps from food trucks at The Village Markets, it’s a short drive north to Mermaid Beach’s organic, gluten-free cafe, Maria Anitas. 3PM Want to know where the locals gather on a sunny Sunday afternoon? They’re cheersing the good life on Burleigh Hill, that’s where. BYO beach throw and bottle of bubbles (we won’t tell) but don’t get too comfortable, because dinner awaits! 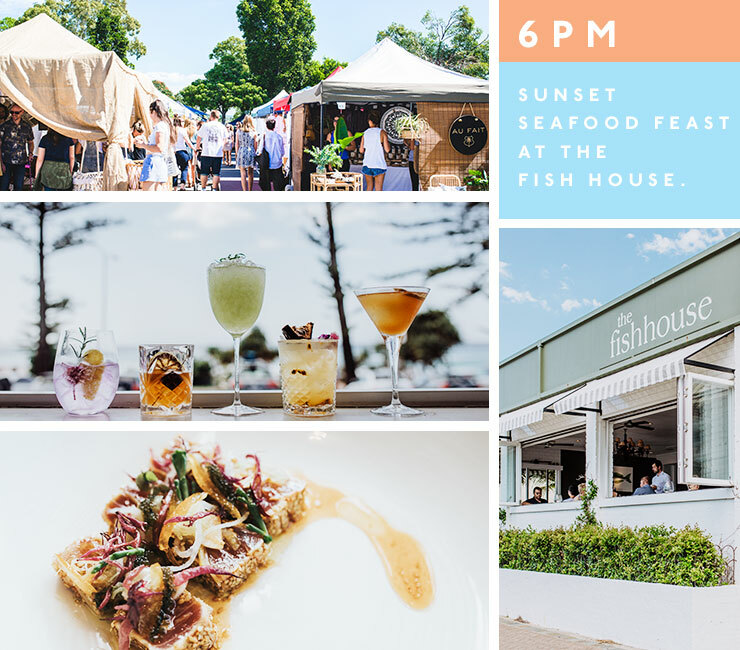 6PM Dining early is mandatory if you want to catch magic hour from your window-side seat at fanciful Burleigh restaurant, The Fish House. With produce both locally-caught and flown in fresh that day, take your pick from the seafood cabinet or settle in for a decadent five-course chef tasting menu. Wine paired, obvs. So, you’ve conquered the Burleigh royal tour on your luxe weekend away? If you’re the holidaying type that can’t squeeze enough in between the hours of sunrise and sunset, check out our local’s guide to the Gold Coast, from rainforest hikes to waterfalls, to craft brewery hopping and hidden swimming spots, you’ll be planning your return trip before you’re on the plane or drive home. Editor's note: This article is proudly sponsored by bon Sol Luxury Apartments and endorsed by The Urban List. Thank you for supporting the sponsors who make The Urban List possible. Click here for more information on our editorial policy.